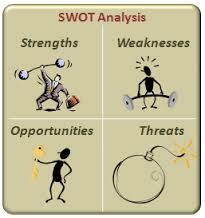 SWOT analysis is a time tested and valuable method to examine Strengths, Weaknesses, Opportunities and Threats. It has been used in corporations and organizations for decades as a vehicle to identify areas of potential improvements or growth. super powers so you can enhance them further and use them in more situations. Whether you are looking for work or a promotion, you face competition and are well served if you can identify what differentiates you from them. The answer that is revealed is usually your strength. Weaknesses – we all have them but sometimes have not identified them in order to work toward improvement. We don’t want our weaknesses to overshadow our strengths so it’s important to know what they are and design an action plan for improvement. In addition to awareness and development of an action plan, it’s beneficial to have an accountability partner with whom you trust and can provide you with feedback. Opportunities – this factor can be personal; you realize, for example, that you have a need for additional training or professional growth or it may be an external situation, within your career field or industry, which presents opportunities for your career. Be open to recognizing that changing market conditions can lead you to a different career path. Or, perhaps, you explore another area within your career. These examples are but a few that, when explored, could lead you to your next promotion or an entirely different career field. Threats – we all have experienced changes in our jobs as well as in the organizations, industries and fields we work. Often we approach a threat negatively since it represents short or long term pain (i.e. a layoff); however, threats can also be viewed as opportunities. We all know people who are in a different career now due to being laid off and having discovered a field that would have not been selected otherwise. Don’t let yourself be surprised. Be prepared. It is important to identify existing or potential threats in order to stay ahead – both career-wise as well as emotionally. I am often asked: “Of the four factors, which is the MOST important” and I reply that I think knowing your signature strengths and capitalizing upon them is the key to success. If you are, for example, a salesperson and your strength is cultivating lasting customer relationships, congratulations. You may not have the most technical knowledge, but your clients think you do because you are resourceful, care about customer interests and provide them with what they need. Each person is unique and most of us are familiar with some of our shortcomings but fail to give ourselves credit for our strengths. I challenge you to perform a SWOT analysis, identify your strengths and use them in more and new ways.